This week I’m on a roll with delicious vegetarian recipes.I am having so much fun trying out new recipes that wouldn’t ordinarily be on my radar. Which is exactly what this challenge is all about. I’ve branched out to veggies and grains that I only use once in a while. Leeks, cabbage, and brussels sprouts have become mainstays in my fridge and pearl barley, and bulgur have joined the brown rice and quinoa in the cupboard. My whole-grain-loving mother would be proud! Just before thanksgiving I posted about my favorite Thanksgiving dinner side dish, brussels sprouts with carrots, this weeknight dinner is maybe its Italian cousin. Shredded brussels sprouts sautéed with a drizzle of olive oil, a pat of butter, a splash of cream and tossed with toasted pine nuts, that’s it. Simple and delicious. You really don’t need a whole lot more on a cold January evening after work. In the time it takes the pasta water to boil and the linguine noodles to soften to al dente you can shred the brussels sprouts and sauté them until they are soft and silky, but not over cooked. 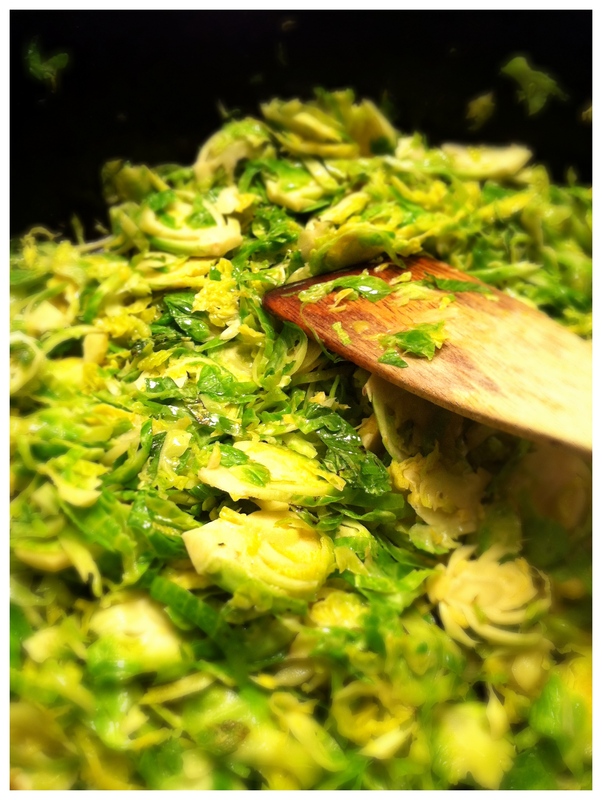 That really is the worst thing you could do to this recipe is over cook the brussels sprout ribbons. They should be tender but not mushy, unless you want unpleasant flashbacks from cold, mushy brussels sprouts on your childhood dinner plate. Cooked properly, these will banish any memory of the cold, unpleasant version. If you want to add some meaty goodness to this dish you could certainly add some bacon to it. Swap out the olive oil and butter, instead cook a couple of slices of bacon in the skillet, when they are crispy remove them but reserve some of the drippings to sauté the brussels sprouts in. Maybe I’ll give that a try in February. While the water boils and the pasta cooks, sauté the pine nuts in a small skillet until lightly toasted. Watch them carefully because they will burn quickly! Remove from pan and reserve for later. Over medium-high heat in a large skillet, heat olive oil and butter, you will want it to get quite hot . 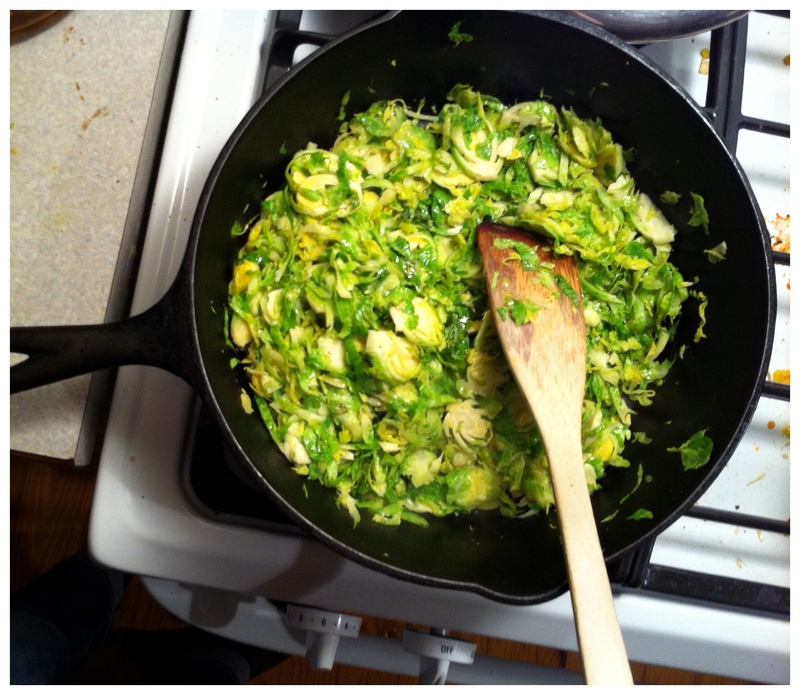 Add brussels sprouts and salt, sautéing until they are tender and bright green, about 4 or 5 minutes. Transfer to a large serving dish. When the pasta is ready, reserve 1/4 – 1/2 cup pasta water and drain the rest of the pasta. Toss the pasta with the brussels sprouts and add the cream. If the pasta seems dry you can add some of the pasta water. Taste and add salt and pepper if needed. Top with pine nuts and grated Parmigiano-Reggiano. 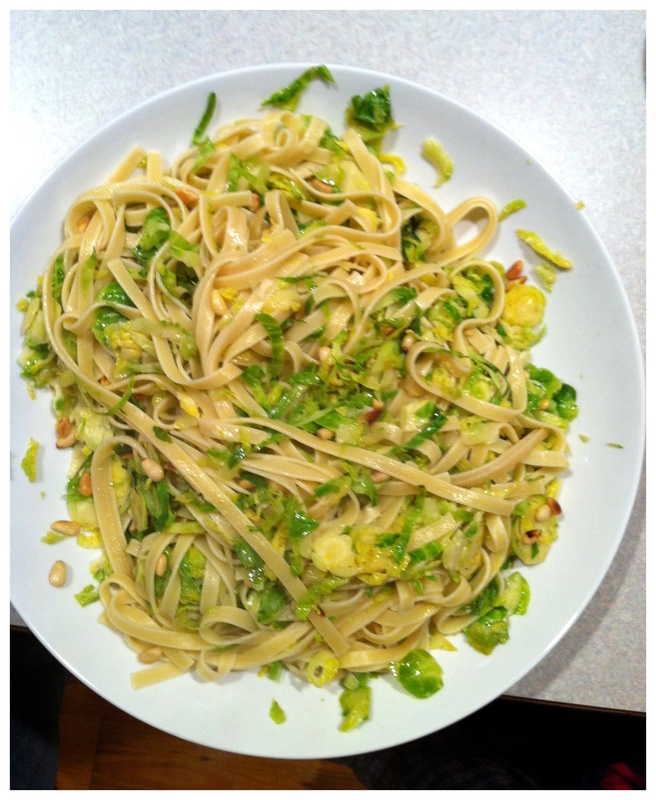 This entry was posted in Pasta, Quick dinner, Vegetarian and tagged entree, pasta, quick-dinner, Vegetarian, Winter. Bookmark the permalink.